Some weeks are full of joy. Others, not so much. Sure, we discovered that Android M will be called Marshmallow, but this week we also discovered that we can't get the best mobile phone display ever made, that Google's Project Ara is falling apart and that we won't be able to bend other people's iPhone 6Ses. Still, it could be worse. We could be Ashley Madison website users. It's a totally faithful week in tech! Lock up your lovers and get your lawyers on speed dial: the hacked user data from infidelity website Ashley Madison is real. It's easy to get on a high horse and blame the victims here, but the breach is serious for several reasons: not only does it demonstrate how vulnerable and how poorly protected sensitive online data can be, but that data could be used for fraud, blackmail and even jeopardising security: many of the leaked addresses belong to military, public sector and political employees. Good news! The Samsung Galaxy Note 5 has the best display on any phone or phablet ever! Bad news! It isn't coming to the UK! According to the screen studiers at DisplayMate, the Note 5 and its sibling, the Galaxy S6 Edge+, have the best screens ever: the highest colour accuracy, the highest peak brightness and the highest contrast rating in ambient light. That means if you're a Brit who wants the best screen around, you'll have to pay a fortune for the S6 Edge+. New versions of the Nexus 5 and Nexus 6 are imminent, and they're sounding pretty tasty: the LG-built Nexus 5 is likely to be better built, Android Pay-enabled, USB-C charging and with a bigger, brighter screen and a much better camera, while Huawei is working on a new Nexus 6 that's apparently made of metal, rocking a USB-C port and packing a very powerful processor. Now that Android M's name has been announced, the launch of the two new Nexuses shouldn't be too far away. Sony's SmartBand is back! Back! BACK! – and this time it's even smarter and more bandy than before. The cunningly named SmartBand 2 has an accelerometer and heart rate sensors, automatic sleep detection, a body-aware alarm clock, a waterproof body and two-day battery life. It can notify you of messages, control your music app and bring your ancestors back from the dead. We're lying about that last bit. Hey Apple! What's Tim Cook-ing? 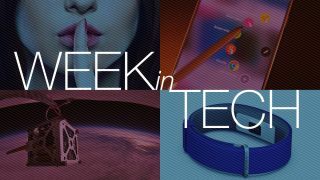 It wouldn't be week in tech without a whole bunch of Apple rumours, hacks and leaks, and we've got a bumper selection this week. A developer has found a hack for the Apple Watch that enables you to add your own watch face; we've got some brand new iPhone 6S rumours, including what appears to be a considerably less bendy frame; and we've found out who's playing the Apple Music festival in London next month. We've also got news for anybody waiting patiently for the iPad Pro: it's coming, but the earliest we're likely to see it is November. The BBC has updated its iPlayer apps, enabling you to continue viewing across multiple devices, travel back in time so you don't miss the start of a programme or event, and keep track of programmes you've started but haven't yet completed. Sky+HD boxes now get Watch From Start, offering instant download of movies already playing on Sky's various movie channels and the ability to store watchlists of things you want to see. Most of us have wanted to boot our printers into orbit from time to time, but Made In Space is doing it without malice: the Californian start-up wants to send 3D printers into space to make it easier for astronauts to assemble tools and make stuff, perhaps including ray guns. Not only that, but they want to make the printers accessible to the public. What could possibly go wrong? While Made in Space is doing that, it seems that NASA is raiding skips for spaceship parts: thanks to incredibly tight budgets, the space agency is cannibalising old parts from museums to create new bits of the International Space Station. At the risk of repeating ourselves, what could possibly go wrong? See you next week! Watch the skies!